Based upon a novel design by Professor David Dunstan (University of London, England), the CryoDAC-LT permits adjustment of the pressure on a sample whilst the sample is held at low temperatures. The maximum pressure attainable depends upon the size of the diamond anvil working faces (the culet size), but at least 20 GPa can be reached with samples appropriate for Raman and optical spectroscopy. The Diacell® CryoDAC-LT was designed for use with top-loading cryostats such as the Oxford Instruments CF1204 and its successor, the OptistatCF. However, please note that we already supply a complete solution, including cryostat and this DAC as part of our CF-DAC system The cell fits into a 20 mm diameter bore. It can be made with almost any length of drive below the cryostat plug: devices of 1.5 meters length have been supplied by us. It may even be used immersed in a storage dewar. The cell itself is made of beryllium-copper and measures 27 mm length x 19 mm diameter. Full axial and tilt adjustments are provided to enable accurate alignment of the diamond anvils. The diamond anvils are force-fitted into rings, which in turn are fixed mechanically to the body of the cell for stability at cryogenic temperatures. A unique feature of this cell is that the load is applied to the top and bottom plates, which bear directly on the diamond anvils. The body of the cell is aligned with respect to the bottom plate for tilt, but the load is not transmitted through it. 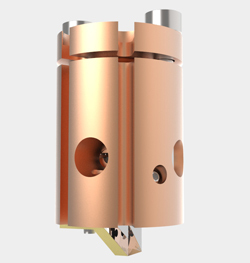 The Diacell® CryoDAC-LT is driven by a hydraulic ram, located outside the cryostat. The ram pulls on stainless steel piano wires which run through stainless steel compression tubes. These wires loop around the base of the cell and return to the clamp above the ram. The CryoDAC-LT is supplied as a complete system, including all hydraulics and couplings, and is shipped aligned and ready for use. Optical access is via the end window of the cryostat if the cell is viewed directly. A prism holder is also supplied as standard so that optical access may be had through the axial windows, normal to the cell axis. Provision is made for both fiber optic and electrical access via a feed tube located just above the cryostat plug. This cell is suitable for Raman and optical spectroscopy. Provisions have also been made to enable electrical work. Please note that we supply a complete solution, including cryostat and this DAC as part of our CF-DAC system. Maximum pressure is dependent upon the culet size of the anvils. Almax easyLab is committed to its policy of continuous improvement. easyLab and Diacell are registered trademarks of Almax easyLab Ltd.